Are you the owner of a Funeral Centre, run a Church website, a county's webmaster, a newspaper's webmaster or planning to build a Tributes portal and are looking for a product to manage obituaries, graves, funeral centres, condolences etc? 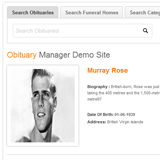 Here is the Complete Obituary and Tributes solution. Check it out. Simple and Intuitive control panel. Manage various configurations from backend. It allows you to manage Funeral Homes and display it on Google map. 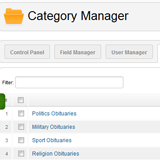 Create and Manage subscriptions and packages for submitting obituaries. Field Manager allows administrator to create Custom fields on Detail Layout. 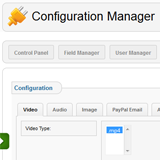 Manage Users in complete Sync with Joomla User Manager. This allows Users to bookmark Obituaries in their browsers. Approve Condolences submitted by Users. Add/Upload Audio/Video in Obituaries. Also the ability to add Youtube videos. Let users submit Condolences in Obituary with Captcha Spam Security. Print obituaries from the front end. View obituaries listing with their detail pages encompassing everything about the related obituary. 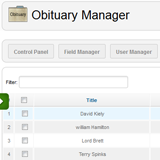 This allows admin to track number of users visiting the Obituary's page. It displays all recent twitter feeds from Obituary's Twitter Profile. You can like and share obituaries. It allows user to share predefined condolence gift on Obituary. 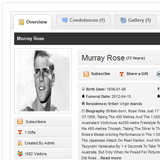 It allows users to subscribe to Obituaries' condolences. "I needed a component to list obituaries on my Funeral Home website. 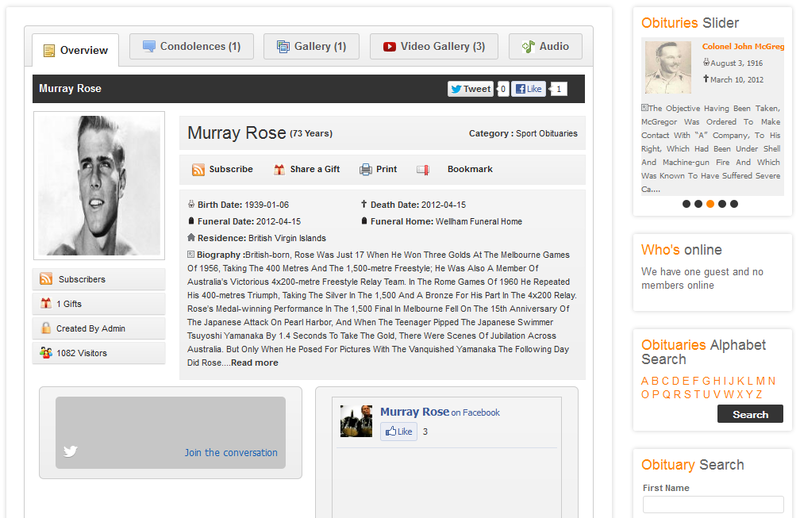 This is the only Obituary component seem to be available for Joomla and so far, it has been a great experience. 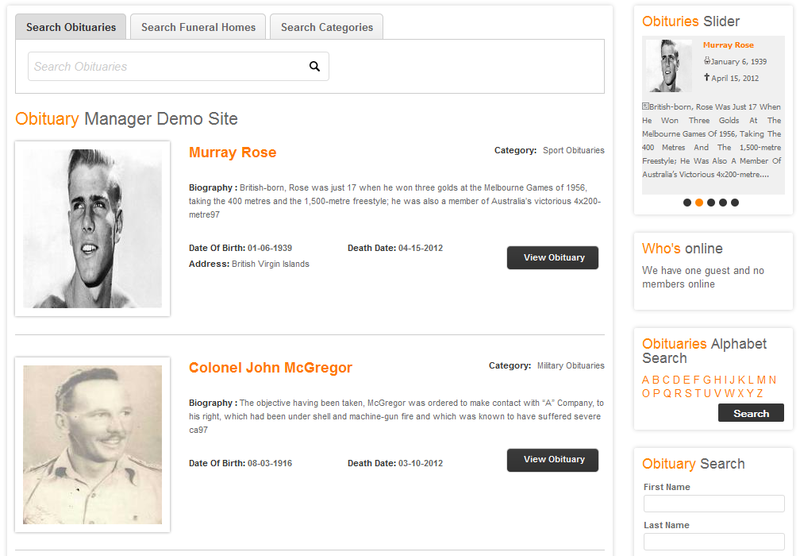 Pretty simple layout to add obituaries from the backend. The frontend too is finely done with listings and modules. I am waiting for their next version's release. Hopefully it will be out soon." "Very Impressed!! Very simple and easy to use! Easy to install, easy to customize, dedicated support. At par with the high-end Obituary Listing portals out there. One feature I wish to see in the next version: Option for admin to choose to display videos/audios on a particular obituary listing." Customized Android app for your Obituary listings website. Q: Does it include customizations? Answer: It includes basic customization including basic layout changes and setup. Any additional customization request shall be paid.